Whether you love sweet treats or savory snacks, I am confident you'll find something you'll like within this list. For those of you who have dietary restrictions or are just seeking a healthier lifestyle, who says that we're leaving you out? Not Sir Rocha Says! Our Bake Shop journey will find something that appeals to all of you. Scratch Bakeshop has mastered French Macarons. The Salted Caramel ones make me weak in the knees. 1 SCRATCH BAKESHOP, 113 Park Ave., 585-360-4844. The Park Avenue area welcomed Scratch Bakeshop last month and I am pretty sure we are never letting go of them. Owners Molly Hartley & Kate Cassels have joined forces to create one of the most creative & inspired bakeries I've ever visited. Need some proof? Follow them on Facebook or Instagram and you can understand why I salivate over their desserts day to day. They offer a range of both traditional and allergen free desserts. Gluten Free and Vegan is their specialty. In fact, if you ever dine at the Owl House, don't be surprised to see Scratch's Vegan Cakes on the list. Scratch Bakeshop offers fun and unique flavors like Sweet Potato Cheesecakes, Vegan Cookie Dough Cupcakes, Dark Chocolate Blood Orange Olive Oil Cake....Seriously? I have been stopping in on a weekly basis to buy treats and I'm not sure what I love more, the desserts or the ladies who work here. Molly and Kate are hard-working, down-to-earth, and exceptionally talented individuals. You can meet these Tough Cookies yourself when you visit! Dragon Sweetie is my new South Wedge joint. That's the joint, that's the jam. 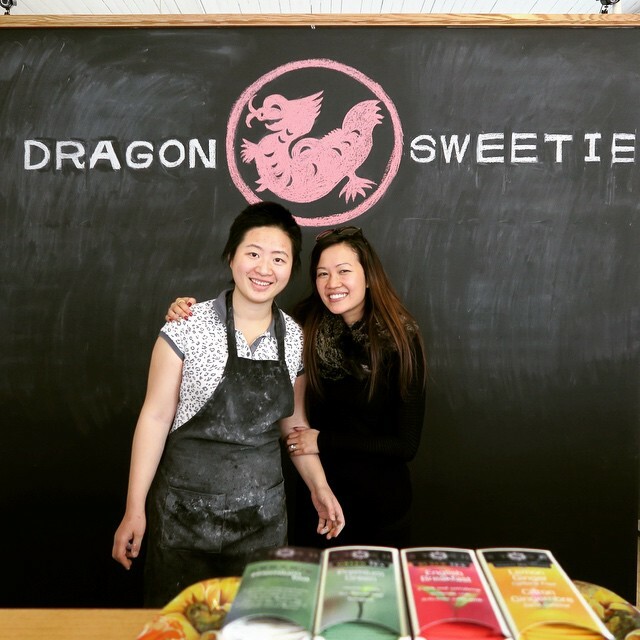 2 DRAGON SWEETIE BAKERY *(Currently closed as of August 2015), 389 Gregory Street., 585-489-3016. Dragon Sweetie moved into the South Wedge this past September. Ai-ya-ya, so many reasons why this bakery has become one of my favorites. The first is owner and baker Tina Yuan, her dedication to the business shines through. She wakes up at 3am every morning to make freshly baked bread and pastries for us, Rochesterians, to happily consume. The second is her use of natural ingredients, every Tuesday, the 'Organic Five Grain Loaf' is offered. The third reason is the immersion of Asian and French influences in her baking. A primary example of this, is the Red Bean Croissant which is made from house made red bean paste. Delish! Fresh baguettes, Parmesan sourdough bread, flaky croissants, ginger scones, and more. If you recall from my brunch post, I talked about Dragon Sweetie's neighbor ButaPub, who actually serves their Red Bean Croissant on their brunch Menu. Do you feel all this love between our businesses? Because I sure do. Time to make a trip to the South Wedge my friends. 3 BAKER STREET BAKERY , 745 Park Ave., 585-241-3120. Warning: You should not leave Park Ave without stopping by Baker Street Bakery OR Scratch Bakeshop for that matter. While Baker Street is not 'New' in the sense that it just opened, it's still a relatively new experience for those who haven't heard of it or perhaps have driven past it. 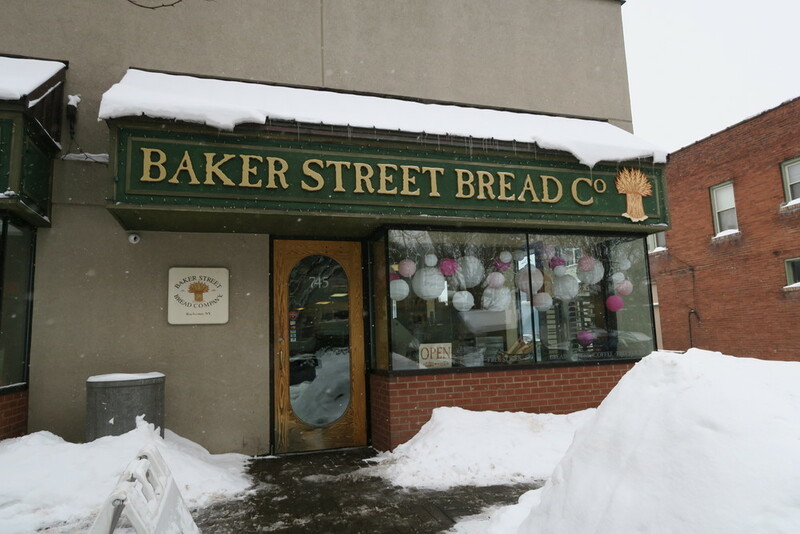 Imagine walking into the smell of fresh baking bread and you start to get all giddy inside. You know what I'm talking about. Well that is how you will feel when you walk into Baker Street. I get all sorts of giddy as I pass by one of the bakers, rolling out fresh dough for all to see. Near the counter, you will find a wide selection of pastries, cookies, pies, cakes, and freshly baked breads. This place is a STAPLE on Park Ave and I now understand why. I would suggest making a stop at Pour Coffee Parlor (right down the street) grabbing a Mocha Kick Latte first and then scooping up some goodies at Baker Street to take home. Voula's Sweet Treats are mesmerizing. You will eat me. You will eat me. 4 VOULA'S GREEK SWEETS, 439 Monroe Ave., 585-242-0935. Oh hey Voula's Greek Sweets! This special place just celebrated their 3 year anniversary. We knew you had a tasty brunch, but we didn't know that you had such tasty sweet treats. 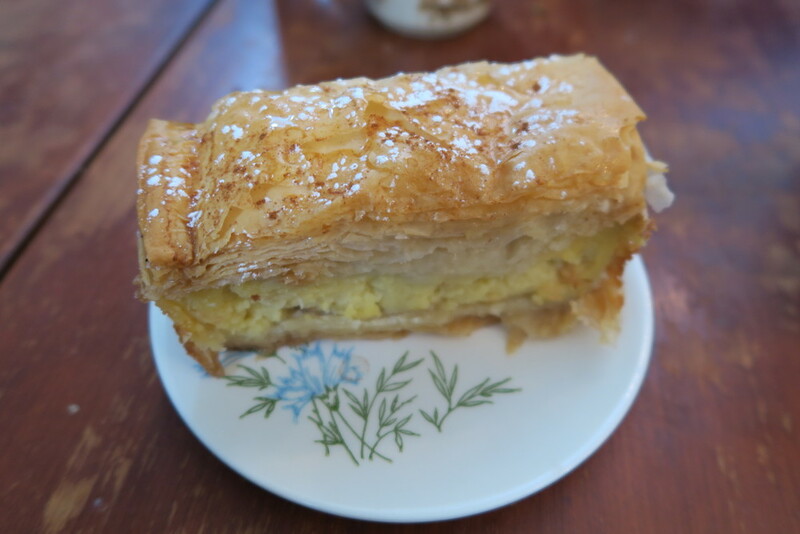 If you've never been into Voula's, one of the first things that will catch your eye is the beautifully presented glass case of Homemade Greek pastries. A mix of traditional, vegan, and gluten free options are waiting for you to to dig into. Baklava (Vegan Options available) Chocolatina, Kariokes (Chocolate Fudge Bars mixed with nuts, cognac, and dark chocolate topped with pistachios), Sponge cake with bavarian cream, cookies, biscotti, and so much more. The owner, Voula Stratton, has put her magic touch on these authentic pastries and it's nice to change up your dessert profile and try something new. You can close your mouth now. I had the same reaction. Pudgy Girl Bakery you are speaking my language. 5 PUDGY GIRL BAKERY , 630 East Ave.., 585-678-1603. (Sold at Abundance Co-Op or Balsam Bagels) Are you looking for 100% Vegan desserts? Well Pudgy Girl Bakery has some in store for you. Owner and baker, Jenny Johnson went to school for photography at RIT and started sharing her Vegan delights with her fellow classmates and professors. Word started to spread and her baking career transpired into a business. She has been baking up a storm ever since. Her Vegan Cheesecakes (Available in multiple flavors) and Truffles can be bought daily at either Abundance Co-Op or Balsam Bagels. Abundance is small in size, but has a ton of natural products up the ying yang for a reasonable price. You can find those Sriracha Truffles displayed above near the check-out. Spicy and sweet! Balsam bagels located in the North Winton Village, also carries her products and other tasty vegan options! Jenny also makes custom cupcakes, cheesecakes, pies....you name it, she will make it. You can also stop right into her kitchen too on East Ave if she's there, just call ahead! I said, Brrr it's cold in here, there must be some Java's in the atmosphere. Oh e oh e oh. Ice Ice Ice. P.S. These Almond Croissants at Flour City Bread are life-changing! 6 FLOUR CITY BREAD 52 Public Market, 585-957-3096. Just because it's cold out, doesn't mean the Rochester Public Market off Union Street is closed. On Thursdays and Saturdays, you can make a trip out to the market and get your choice of Flour City croissants, egg danish sandwiches, tarts, pastries, a variety of artisan bread, and then some. Flour City Bread prides themselves on quality ingredients using only organic flour and staying away from preservatives and conditioners. They make their bread and pastries in small batches, so I would advise going to the market on the earlier side, so you don't miss out on this deliciousness! What I like best about coming here is that not only do I have my fresh croissant in hand, but I also get to warm up with a cup of Java's coffee next door, which for those of you who don't know turns into Cure at night and for their Sunday Brunch. Java's Coffee and a Flour City Croissant? Sounds like the perfect Saturday morning in the market to me! Thanks for reading my latest post! All of these experiences are based off my own adventures and I'm looking forward to hearing about yours. 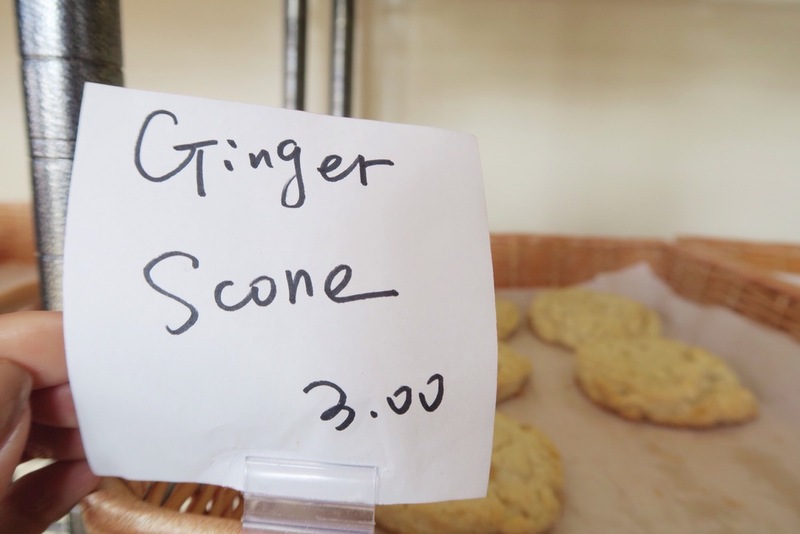 I've included a few more pictures below to entice you to start your Bake Shop Tour of 2015. Maybe I'll even run into you at one of the bakeries and we can chat over a delicious treat. Until then, stay warm Rochester! ***Bonus Mention: You need to try the Russian Braid Twist at Atlas Eats ( 2185 North Clinton Ave.) That is all. Happy Sunday!